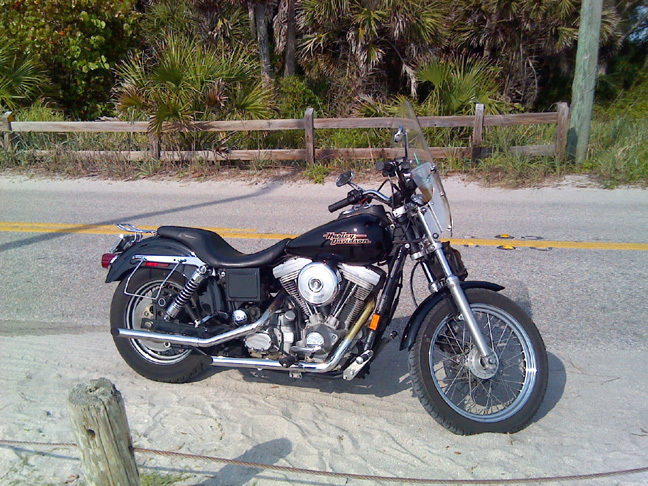 This article is about my 1998 Harley-Davidson Convertible Super Glide. And what they mean by convertible is, that the windscreen is removable with 2 clips on the forks. The engine displacement is 80 cubic inches or 1340 cc. The bike is stock excluding the vintage Harley Davidson saddlebags and the drag specialty 40” in exhaust pipe with internal cones. It also comes with an electronic ignition. As far as the internal cones, they sit up against the exhaust port on the cylinder heads. This provides back pressure for the exhaust while giving it the sound and characteristics of straight pipes. My last Harley-Davidson what’s a 1958 Panhead with a dog leg frame. It was and incredible motorcycle that was my all-time favorite bike but, I must say kickstarter’s are for kids. And the Panhead was not as reliable as the 1998 blockhead, also known as Evo’s. And anyone who’s ever ridding a non rubber mounted motor such as a shovel head, Panhead or a knucklehead will tell you that they are vibrating machines. As for me, I could only ride for about 10 miles and the vibrations of the Panhead wood make my hands start to go numb. With the Blockheads these are rubber mounted motors, along with some other improvements that virtually eliminate that problem. I had growing up riding Japanese bikes and as a young teenager I was drag racing Kawasaki 2 Strokes for years. And up until a few years ago I had 1978 KZ1000 that I also had ridden for a very long time. But now that I’m older and all banged up there was no way that I can still ride a mid shifter anymore. So having a Harley with front pegs or forward shifter makes it to were my riding time will go on for who knows how many more years. And I think it’s this way for many people. But what I like to say in closing is from the first time that I had ridden my former roommates Shovelhead as a teenager, I thought that Harley Davidson’s we’re the coolest thing ever made. And to this day I feel the same way. I even enjoyed in the 70s when I had right hand shifter Sportsters, which at first were very tricky being that you would every once in awhile think you were hitting the brakes and kick the shift lever into a lower gear, hello.